These days, I have been using multi-pens a lot. They are convenient, and given that there are many customization options available, it's easy to make one that suits your daily need and lifestyle habits! I tried out both the Pilot Hi-tec Coleto (previously featured here) and also the Uni Style Fit. Both are multi-pens from different brands. I shall do a short comparison on each pen. 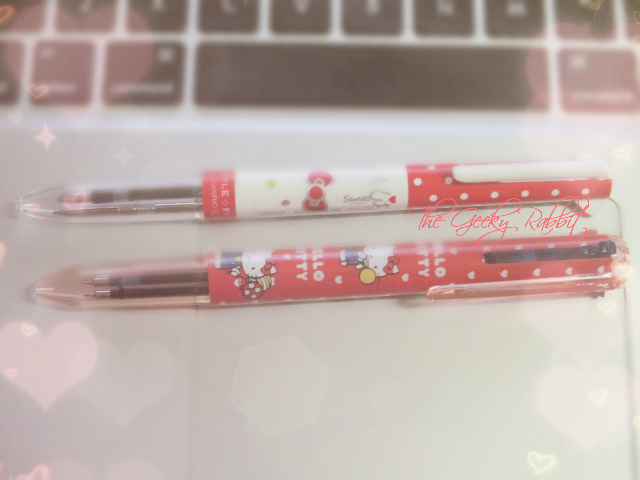 Shown here are Hello Kitty Multi-pens from Uni Style Fit (top) and Pilot Hi-tec Coleto (bottom), both with 3 colors. Different casing designs and sizes too. I know the Pilot one has 2 to 5 colors, while the Style Fit should be 3 to 5 colors. Different refill ink thickness. I usually pick 0.38mm for both brands. Refills for gel pen and mechanical pencil available for both Uni and Pilot. Very awesome! 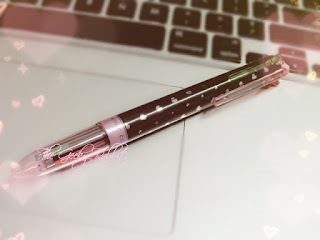 Especially for the mechanical pencil part, as it's extremely convenient to have a pencil with the multi-pen. Has various unique refills like eraser refill and stylus refill. The stylus is for resistive screens such as Nintendo DS. Very interesting indeed! However, do note that it's quite hard to get the refills for the eraser and stylus. Most retailers that I have been to are usually out of these two types of refills. Has fancy colored pen 'sides', such as hearts and stars in the respective colors of the pen ink. Pretty unique and pretty! The clip for the pen casing actually serves as a refill barrel. Hence the Uni Style Fit is extremely compact and space efficient! On top of gel refills, they offer ballpoint refills for the basic ink colors- blue, black and red. Comes in various thickness too. Great for people who don't like gel inks. Very basic colors that will come in handy. Both pens are awesome and a great study/work companion. I usually carry at least one with me when I am out and about, and my must-have refills are (1) mechanical pencil (2) either black or blue ink. I sometimes switch out the ink refills according to my mood too! There's lots of new designs for the pen casing from time to time, and the latest one for Uni Style Fit is the Hello Kitty collection. Of course, being such a Hello Kitty fan, I picked up several of the pen casings and am very pleased with the designs!